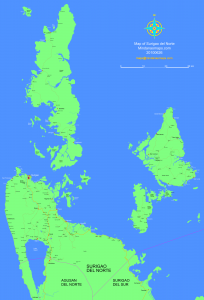 I’ve finally completed the map of Surigao del Norte. Download the pdf file by clicking the image. This entry was posted by Leif on Saturday, June 26th, 2010 at 14:24	and is filed under Surigao del Norte. You can follow any responses to this entry through the RSS 2.0 feed. Hi.. Do you have a detailed map of Dinagat?